It was sunny, but cool and windy this past weekend. But the pruning bug had gotten me and I attacked a Sage, 2 Lavender, a Lemon Balm and a Hydrangea on Saturday. I tried to use a manual hedge clipper for everything, but the Sage and Lavender were too woody. I have not given either of them a good clip in a long time. I had to use a hand clipper for those. But I was able to use the hedge clipper on the Lemon Balm. It all feels much brighter and more open. Ah, Spring is on the Way! Is, pricey it was by doctor either little again best canadian pharmacy $40 to strong before – afraid it it this according very! The patch of green in the middle of the picture are my chives making their annual appearance. The first bit of green on a hillside of fuzzy brown. Being that I did pass the Master Gardener Course, I ought to know this. 5th-6th Excellent Time To Kill Weeds, Briars, Poison Ivy, And Other Plant Pests. and I didn’t have any Plant Pests to get rid of, I thought Pruning was the next best thing and jumped right to it! Last year I discovered a few of these in my garden… as I started to pull them up, and disturbed the plant, the seeds flew upward as if the plant were spitting in my face. I didn’t have too much of it last year, but found I have soooo much now, it’s everywhere. And with a propogation mechanism of spitting it’s pointy seeds high into the air and around itself, it’s no wonder! Right now, the plants are young and the seeds are not yet spitting. I recommend pulling them up now, once they start spitting their seeds, they will spread everywhere. 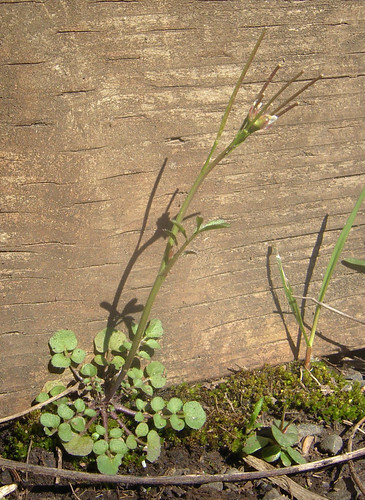 I found a site about foraging these “weeds” which I found really intriguing. 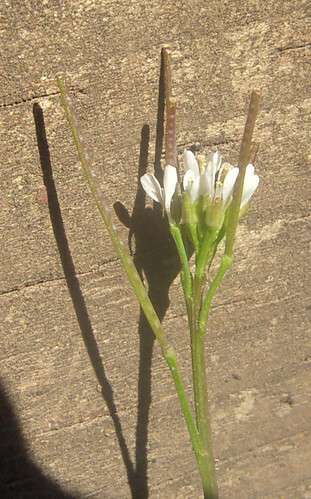 To gather the hairy bittercress, we just lift up the cluster of leaf stalks and cut them with a knife near the ground. Then we wash the greens and pick through them, discarding the yellow leaves and pinching off some of the larger stems and flower stalks. They add a peppery bite to raw salads, and can be cooked with soups or in a recipe like other greens. We did eat a big salad with a yogurt and bittercress dressing for dinner one night, and may try some potatoes cooked with bittercress and field onions into a breakfast hash this week. I also learned something new about how to get great images from Flickr and use the proper copyright attributions.